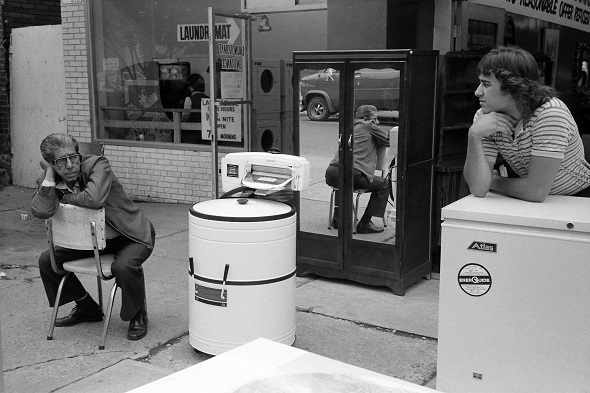 Avard Woolaver arrived in Toronto in September 1980 to study photography at what was then called Ryerson Polytechnical Institute. Coming from rural Nova Scotia, the young photographer was dazzled by the big city that he now called home and immediately started shooting. Fortunately for us, the record of these wonder years is now available as a book titled "Toronto Flashback." Dundas and Victoria before the Square. For those of us interested in mining the visual archive of the 1980s, the Ellis Wiley Fonds at the Toronto Archives are indispensable, but for all the crucial documentation of the the decade, the photos are mostly snapshots. That's one of the reasons Woolaver's work is so fascinating. This is a record of Toronto with a soul. 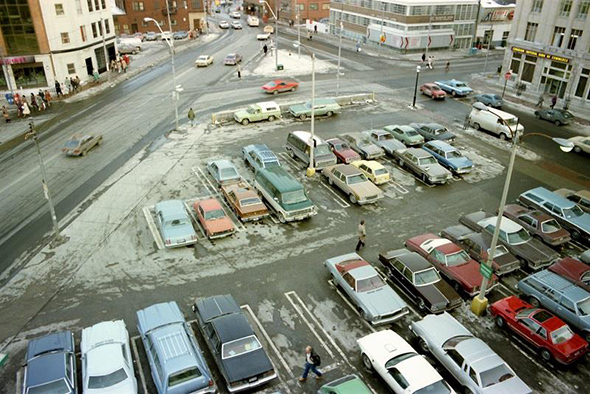 Looking toward Queen and Portland, now site of a Loblaws. "Many of the early photos from '80 and '81 came from school assignments — reflections, shadows, exploration of the frame, use of graphic elements, etc.," Woolaver explains. "Aside from completing these projects, my aim was to document the city, and try to show a sense of humanity, as well as to expand my photographic vision." Not a craft beer in sight. 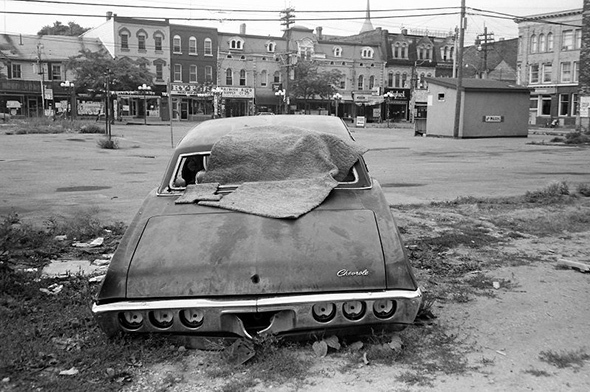 Inspired by the work of photographers like Robert Frank and Lee Friedlander, Woolaver's documentation of 1980s Toronto is gritty and delicate all at once. The pre-gentrification Junction (Mavety and Dundas). 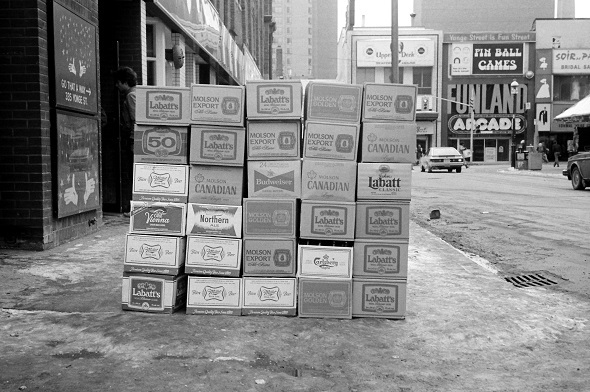 Along with showing just how different the urban landscape of Toronto was 30 years ago, the collection is a reminder that the city had more of a working class vibe during this period. New Image Studio and Gallery, the Junction. "I started out feeling that Toronto was cold and impersonal, but that changed quite quickly as I got settled in," Woolaver recalls. "I realized the city was a multicultural centre with a vibrant arts and music scene. 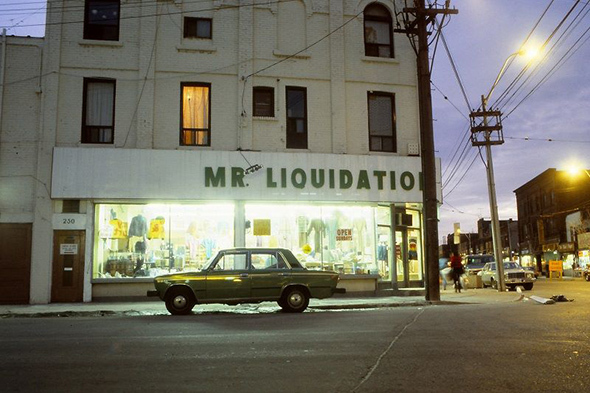 A snippet of Kensington Market in the 1980s. 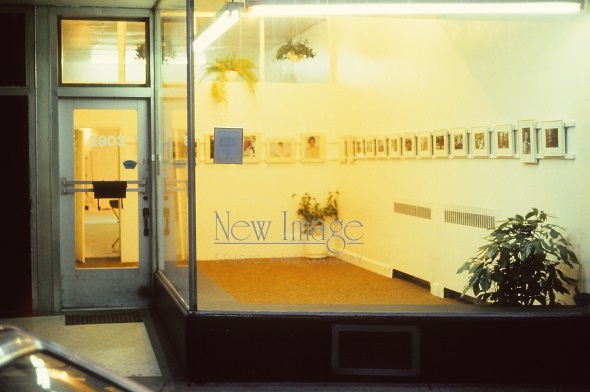 My friends and I rented a large storefront in the Junction and started New Image Studio and Gallery. It was before the housing bubble and condo era --ventures like that were still possible." Looking west across Queen at Bathurst. Woolaver left Toronto to move back to Nova Scotia in 2005. Returning to the city almost 10 years later, he noticed profound changes that helped to inspire turning his Toronto Flashback collection into a book. 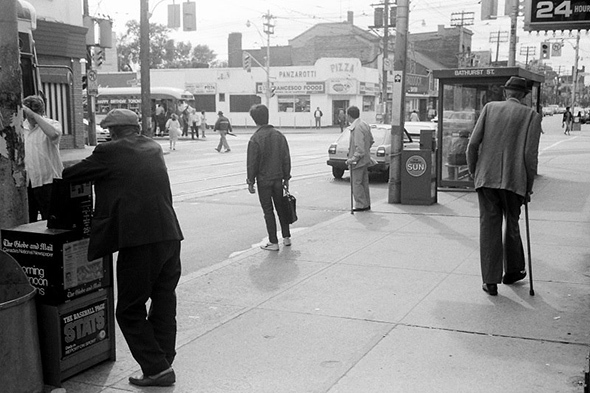 Cigarettes, Biway bags, and a little clutter: Toronto of the 1980s. "The book idea came up one night when my friend Michael Amo and I were looking at some of our old slide," Woolaver explains. 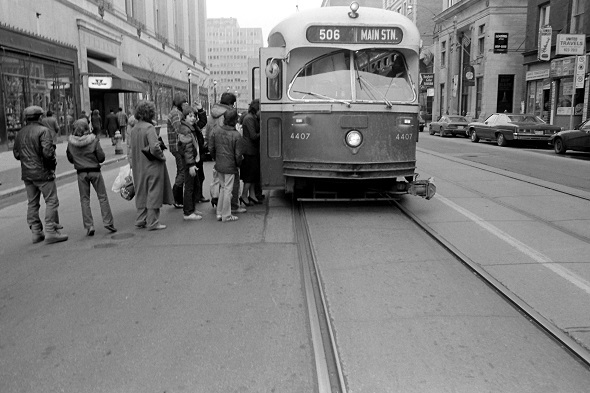 PCC streetcar loading up on College at Yonge looking west. "He and I shared a lot of experiences in Toronto back when I was taking these photos. I realized that the images from the '80s were quite nostalgic and portrayed a city that in some ways no longer exists." Looking north up Yonge from Gould at night. 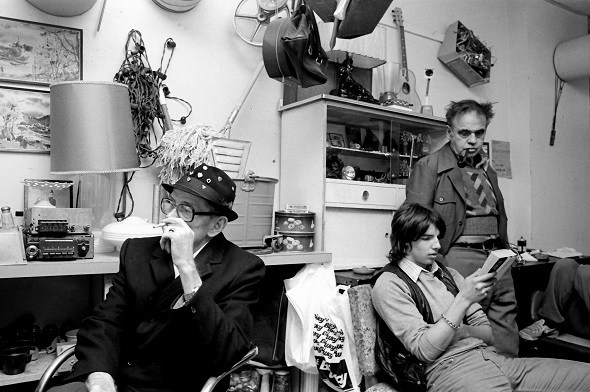 "The Brunswick House is long gone, as are the Edge, Nuts and Bolts, and the Twilight Zone," he continues. 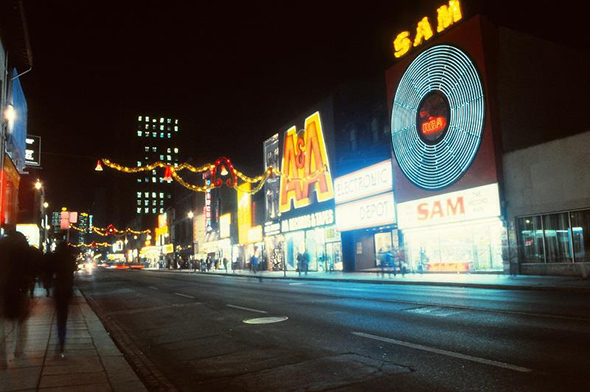 Yonge Street's record store row, now long gone. "Eaton's and Sam the Record Man are also gone. But I feel the biggest change to Toronto, as well as to every city in the world, is the impact of digital technology. People interact with the city and with each other in quite a different way." 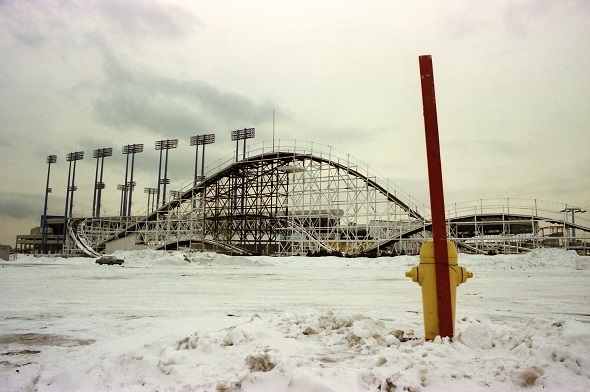 CNE grounds in winter (including the legendary Flyer). Perhaps that's why Toronto Flashback inspires an emotional response from viewers who recall the era the photographs capture. 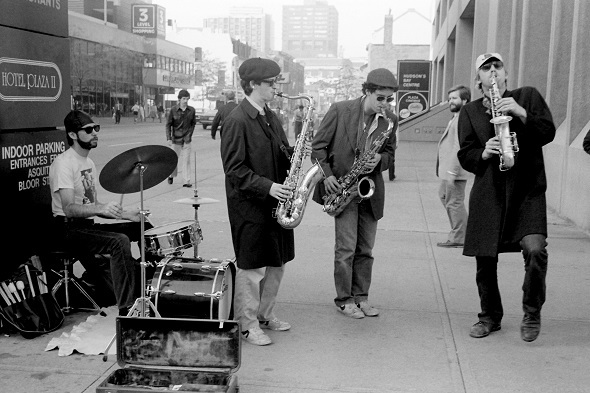 The Shuffle Demons at Yonge and Bloor. 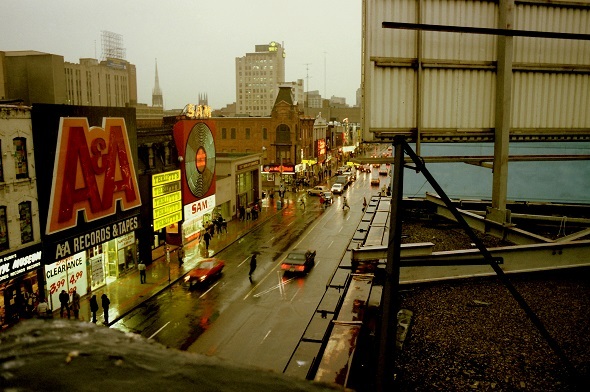 Toronto was much less polished back in the 1980s. It was a grittier city, but in some ways also a friendlier and less cynical place. It was a city with character, much of which has been lost to the march of progress. 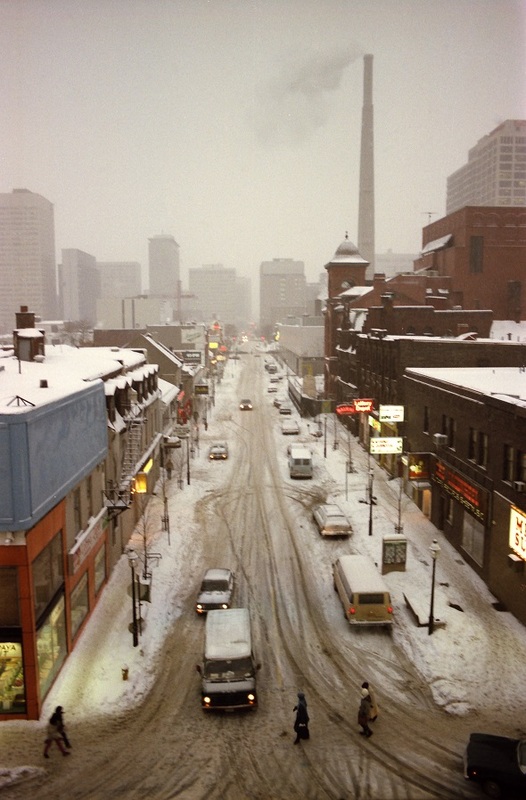 Toronto Flashback (1980-1986) is available through Amazon and Blurb. Looking west along Elm form Yonge (note Barberian's sign at centre left).